Fact: Non-native plants don’t provide the habitat our native pollinators, birds and other insects and animals need. Native plants are the foundation of healthy food webs and functioning ecosystems. 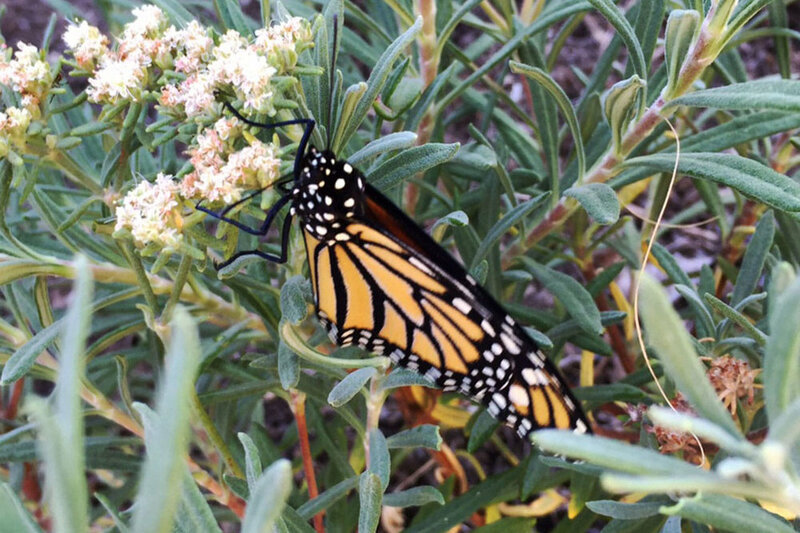 Monarch butterfly on Buckwheat (Eriogonum species) - Image courtesy of the Theodore Payne Foundation. Fact: Only 1-2% of California’s 6,000 species, subspecies and varieties of native plants are cacti. Why? Only about a quarter of California is desert. California’s varied geography of coastal plains, inland valleys and mountain ranges has made California one of the most botanically rich places in the world. Geographic richness = botanic richness. California has a vast array of native plants that are useful in the garden as shade trees, hedges, privacy screens, groundcovers, borders, etc., and many species are suitable for containers as well. Over a third of California’s native plant species are found nowhere else in the world. California is a biodiversity hotspot, a place rich in native plant, insect and animal life threatened by development and population pressure. We support biodiversity by landscaping native. Image courtesy of the Theodore Payne Foundation. Fact: Yes, they do! California native gardens can produce flowers throughout the year! Why? In the late 19th and early 20th centuries, California was known as “the country of flowers” through the work of renowned gardener and writer William Robinson. For an idea of California’s beautiful variety of flowers in different seasons, look at Manzanita (Arctostaphylos species), California Lilac (Ceanothus species), Cleveland Sage (Salvia clevelandii), Matilija Poppy (Romneya coulteri), Monkeyflower (Diplacaus, or Mimulus, species) and California Fuchsia (Epilobium species). And don’t forget California’s spectacular array of wildflowers! In addition, the native garden generates 56% less green waste. Native gardens also reduce carbon emissions because of their decreased water use; one-fifth of California’s energy use is for transporting and treating water. The less water we use, the fewer emissions we make, which decreases contributions to climate change.